Availability: Usually ships in 2-4 business days. FREE SHIPPING: Regular ground and freight to the contiguous 48 United States. Some exclusions apply. • All orders ship from Tucson, Arizona. • Furniture and large quantity orders ship FedEx Ground Freight. (Free) Curbside delivery only. Check the additional shipping services box at checkout. We will contact you before shipping. Additional charges apply. Overnight, 2-Day & 3-Day Shipping is available. You will be contacted with the additional charges before your order ships. See Our Complete Shipping Policy for more information. 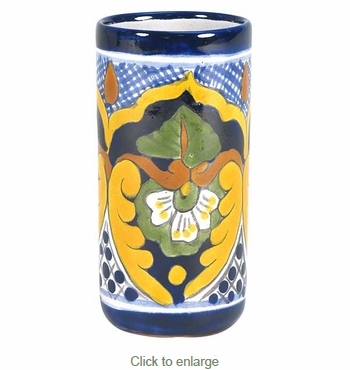 This Mexican Talavera water glass is a refreshing splash of color for your kitchen decor. Talavera is dishwasher and oven safe. All of our Mexican Talavera dishes and serving pieces are handmade and hand painted by Mexico's talented potters. Traditional Assortment: The design shown is of the Traditional Talavera style. Ordered items will be chosen from our current assortment of available colors and designs. The water glasses you receive will likely be different than pictured here.